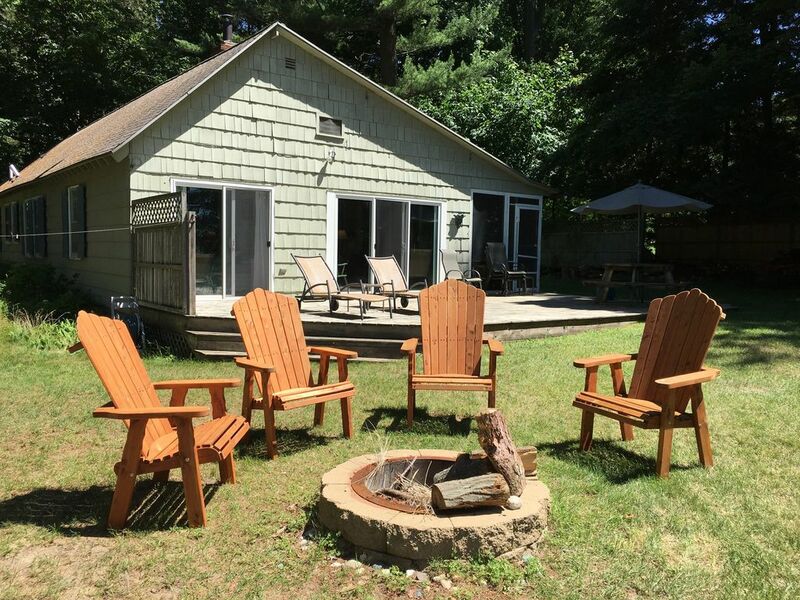 Our spacious summer cottage (White Pines Lake Michigan Cottage) sits on a wooded dune with unobstructed views and private property access to Lake Michigan. The large front yard leads to a footbridge and beach path over two long dunes winding down to our private Lake Michigan beachfront. The path, bridge and steps to the beach are well maintained and easy to navigate. The environment is peaceful and relaxing with private sandy beach. We take pride in ensuring a high quality experience for our guests and look for renters who will treat the cottage as their home. There are three bedrooms that can accommodate a total of 8 people. Bedroom 1 has a king bed, Bedroom 2 has a queen bed and Bedroom 3 has a king and two twins. There are two full baths, one with a tub, and there is a washer/dryer for your use. You can enjoy views of Lake Michigan and breathtaking sunsets from the deck and/or the outdoor fire pit. Relax on the clean, sandy beach, golf, bike, fish, kayak, or walk the shoreline for miles. For golfers, a great public lakefront golf course is just 2 miles up the road. For bicyclists, the Hart-Montague bike trail is minutes away. Kayaking and all forms of boating available. If you enjoy sightseeing, you can find interesting lakefront attractions and resort towns within a short drive! The cottage has comfortable, inviting furnishings throughout and high quality bed linens and comforters on all beds. Two screened porches - one with wicker furniture and an antique harvest table which is great for family dinners or games. On cool nights, you can enjoy the wonderful wood-burning fireplace - some wood is provided for your convenience. The beach is very sandy with very few rocks and a gentle sloping drop off into the water. Beach walks are a favorite past time as you can walk for miles. Responsible beach fires are allowed. We are dog lovers and therefore allow one well behaved dog and responsible owners. Pets MUS BE PRE-APPROVED and a Pet Fee will be applied to the rent. PET POLICY: You must tell us ahead of time that you will be bringing a pet. All dogs must be on leash at ALL TIMES when outside. We only accept dogs that are friendly to other dogs, cats and children. Dogs must be in a crate when you are not in the cottage with them. A pet fee will be applied to your stay. We prefer email correspondence - it is much easier for us to respond quickly! Thank you! There is a window unit in the back bedroom with the King & 2 twins. Permanent wall furnace in main area only.